Place potatoes into a large saucepan and just cover with cold water. Add a good pinch of salt and bring to the boil over medium high heat. Turn down to medium and allow to simmer for around 12 minutes or until just tender when pierced with a knife. Drain well and set aside.While potatoes are cooking combine other ingredients in a jug and use a fork to whisk until well combined. Season dressing to taste with S&P.Toss the potatoes gently will the dressing until well combined and set aside until ready to serve.Tips: *dressing a potato salad when the potatoes are still a little warm will mean the potatoes will soak up more of the flavor. If you do this you may like to make an extra half quantity of dressing to add just before serving. *dressing can be thinned down with a little extra olive oil if desired. *tasting your dressing is important to get it just right – and remember a little extra salt and pepper is a good thing as it needs to be enough to season the potatoes too when it goes on. 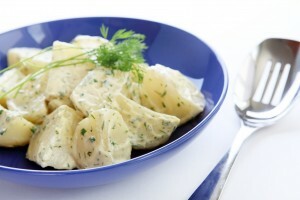 *potato salad is best served at room temperature so remove it from the fridge 15-20 minutes before serving. *an empty clean jar with a lid is the perfect place to make a dressing – just pop everything in, add the lid and give it a shake. Any leftover dressing can be stored in the same jar in the fridge.